We discover the secrets behind the studio's wildly successful Warhammer models. Founded in London in 1975, Games Workshop has grown into a very big business. The firm best known for tabletop strategy games like Warhammer: Age of Sigmar and Warhammer 40,000 recorded a £1 billion market value during June 2018, and expects its profits to double this year. 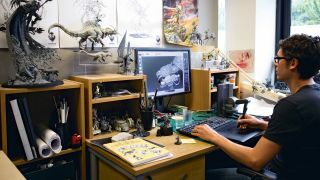 Ferri works with two other concept artists, John Blanche and Tom Harrison, to create the 2D illustrations that inspire the digital 3D art sculptors – 29 of them in total – who lovingly craft and produce the figurines. And there’s always work to do, says design manager Sam Dinwiddy, because the company is constantly developing new lines and doesn’t want to rest on its laurels. That creation process often starts with a simple sketch, says John Blanche, who first began freelancing for Games Workshop in 1977 and went on to spend three decades as its art director. Even the 2D concept art needs to be approached with the physical end goal in mind. As Ferri points out, “These products are physically very small, and you can’t get a lot of detail in there. So our concept art needs to be bold and graphic, and most importantly, based on strong shapes." This article was originally published in ImagineFX, the world's best-selling magazine for digital artists. Buy issue 166 or subscribe.